You must attach great importance to the Indians, the original inhabitants of America. . . . – Abdu’l-Baha, Tablets of the Divine Plan, pp. 31–32. 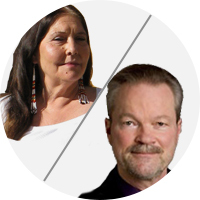 Many Native Americans—and many indigenous people all over the world—have become Baha’is. Their unique spiritual history, passed down through thousands of generations, enriches and enlightens Baha’i communities in Indian nations, on reservations, reserves and in urban areas, as well. Since Baha’is believe that no human culture has gone without guidance from God, this set of articles has endeavored to explore the continual revelation of religious truth to all peoples, with a focus on the Native American messengers of God. This article continues the conversation, which began in the previous essay, between Christopher Buck and Paula Bidwell about those messengers. Paula: Did the ancestors of Native Americans migrate across the Bering land bridge? I don’t know. I do believe the bigger concern, the major historical issue, begins with Manifest Destiny and ties in with the economic, political and social uses of the Bering Strait theory. Manifest Destiny is a complex term and has been used in many ways from a variety of sources. Yet, many of us, especially Native Americans, understand it to mean the God-given right to take what is found, conquer and remake it into the world image of the Anglo-American colonizer. This was also known as the Indian Removal. The colonizers used the term Manifest Destiny to justify slavery of both African Americans and Native Americans. To make this matter worse, some historic records justify this with the belief that Native Americans and African Americans had no souls, and were the same as animals to be killed or tamed as needed. And then, along comes the Bering Strait theory—which created the argument that American Indians were not indigenous to the land, and thus had no more right to the land than the European settlers/colonizers. Some people used the theory to justify the theft of land, attempted genocide and numerous massacres of Native people. What worsens an already difficult and tender situation is the often-repeated statement that Native Americans need to get over the past. This past includes the songs and stories of our places of origin. And to make matters worse, according to the United Nations 2012 investigation into the violations of Native American human rights, the past is not over yet. All of this adds to the controversy and emotional upset felt by so many Native American Indians over the Bering Strait theory. This complex issue has many interwoven threads, both in history and the world we live in today. Chris: How have you personally, speaking as a Native American (Cherokee, Shawnee, Delaware, Seneca and Lakota) Baha’i, come to terms with this part of Abdu’l-Baha’s Tablet to Amir Khan? Paula: My first awareness was that Abdu’l-Baha did not say the Bering crossing happened in only one direction. He did not say that the American continent had no inhabitants—in fact, in another place in the Baha’i writings, The Tablets of the Divine Plan, he calls Indians “the original inhabitants of America.” He did not say that Asians were the only ones doing the crossing. I then realized the most important point was where he stated, “it hath been said,” meaning others have said it. After this, the next sentence became of even greater importance to me: “There are other signs which indicate communication.” This is a definitive statement. I saw an importance in the fact that Abdu’l-Baha used the word “communication” rather than crossing. Communication involves more than one person or place. Communication can be the exchange of ideas and materials—tangible and intangible—between peoples. 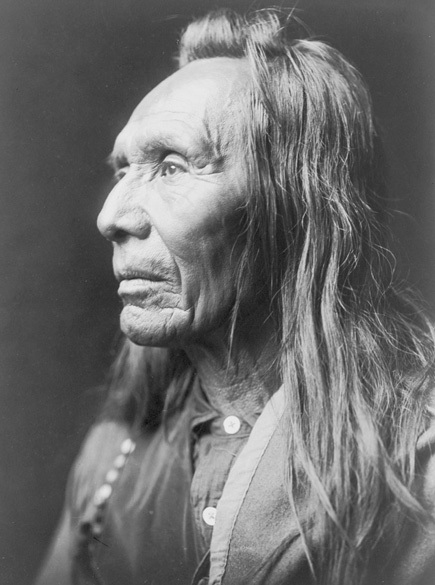 I remember stories of our people from times long past, of those who left the Tribe traveling to distant places and returning many years later with new medicines, techniques and awareness. Also, during these times, language may not have posed such a barrier to communication, since Native peoples had a separate but universal language throughout North and South America. Threads of this language still exist today. So, the word “communication” was a big key for me toward unlocking my initial and painful response to the mention of the Bering Strait. Chris and Paula, I just finished reading ‘A Basic Call to Consciousness’ which may be of interest in the important work you are both doing. You are most lightly aware of this, and if not, it is worth a look as it makes a very strong case for the “Great Law of Peace.” It is a reprint of presentations made by a 21 member delegation of the Haudenosaunee, to the Non-Governmental Organization’s Conference on “Discrimination Against the Indigenous Populations of the Americas,” held in Geneva in 1977. It is available through Amazon if you need a copy. Such an important article for all people to read. We have to inform ourselves thoroughly about these issues and use the writings as the lodestone as you both did here! Thank you! Constantly I am amazed by the subjects discussed and the beautiful manner in which the material is treated. I enjoy every posting of your work! Dear Chris if it wasn't for you I would never have studied this Tablet or written the paper on the Peacemaker, nor done so many other things. You are truly my elder brother. I am forever grateful for all the work you do in all arenas. Resent discoveries, in the Americas, show that people have been there for over 100,000 years and possibly up to 200,000 years. This takes the land bridge theory and removes it from any serious consideration as to the length of time that the Americas have been populated. Hartson: Can you send me a recent scientific journal article that supports that position? The ones I've read earlier this year talk about a time horizon of about around 25,000 years ago. See John F. Hoffecker et al. 2014. Out of Beringia? Science, vol. 343, no. 6174, pp. 979-980; doi: 10.1126/science.1250768. Since I am not automatically notified of comments that are posted, can you send your references to recent scientific literature to me by e-mail? Thanks!